RIFT has announced the upcoming patch details for version 2.6: Dream Weaver, now dated to launch on Wednesday, February 12. Air Saga Storyline: A multi-phase Air Saga allows you to relive the storylines leading up to the Exodus of the Storm Queen, and venture forward in the weeks ahead. Rewards will include “Watcher” and “of the Icewatch” titles, a Storm Griffon companion pet, and Storm Legion Armor for your wardrobe. Dream Weaver Tradeskill: The new tradeskill lets you craft keys for 15 new Dimensions plus special items, lighting and particle effects, and Dream Orb equipment enhancements. Bounty System: Hunt down villains and more, and complete sets to earn achievements that grant titles, animal calls, Dimension trophies, cloaks, and new potions. Combat Pet Skins: New looks arrive in the RIFT store for elementals, undead, beasts, and Fae. Unstable Artifact Set Rewards: Collect artifacts from unstable zone events, and gain new rewards including dual-function items and Planar Squirrel mounts. 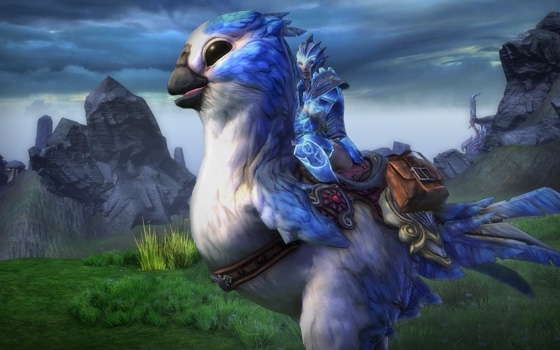 If that wasn’t enough, RIFT is also hosting a special event currently where you can obtain limited edition Budgie mounts. You can get a chance at these from winning daily Budgie races held in Silverwood, Freemarch, Pelladane, and Cape Jule. The Budgies leave as the patch arrives, so get your bets in today! Tagged Arrives, Dream, February, RIFT, Weaver.